If you’re looking for information on whether to consider putting your kids into minimalist running shoe (and my answer would be yes, you should consider it, as well as lots of barefoot time), you need look no further than the September 2012 issue of Running Times Magazine. In the issue of RT, my good friends Jay Dicharry (a physical therapist) and Mark Cucuzzella (a family doctor) wrote a multifaced guide to minimalist running as it relates to the little ones. 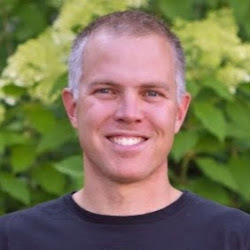 There are multiple articles, a guide to what to look for in kids shoes, reviews of selected minimalist kids shoes (I’ll share some of my thoughts on these soon – you can find some of my top picks in the Zappos ad in my right sidebar), and even a summary of a pilot study on the effects of footwear on the running gait of children. In essence, we still practice the ancient art of Chinese foot-binding. Glance over at the foot of any newborn and you’ll notice that the widest part of their foot is not the ball of the foot but their toes. Then take a look down at your foot. You’ll likely notice that these feet don’t look the same. The narrow toe boxes in athletic and fashion footwear have changed the alignment of our feet, just like braces once did to legs. We’ve been taught that a pointy shoe looks normal — both fashionable and fast — and we’re willing to change our foot shape to accommodate this look. In addition to shoes that bind the foot and change its shape, we typically put kids in shoes that are too stiff to allow natural flexion. 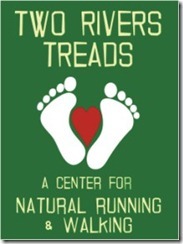 Typical running shoes are produced for a man weighing 150-plus pounds and a woman weighing 130 pounds or more. Many of the same materials are used in the construction of shoes meant for kids who weigh a fraction as much. And the smaller physical size means that all that stitching and those material attachment points net a much stiffer shoe than the adult versions. Kids don’t have the physical weight to flex these shoes. Is this a problem? Yes. The foot is designed to move. And that movement helps strengthen the muscles, which in turn impact the changes in our natural alignment throughout our development. I’ve had the privilege of working with a number of runners who grew up sans shoes, and their feet are different from ours. As adults, these runners don’t rely on stiff shoes because they’ve developed strong, stiff feet. Years of barefoot movement have resulted in robust muscular attachments to anchor and stabilize the foot. The average Western foot — having grown up dependent on shoes — pales in comparison. My daughter has one slightly turned in foot (it doesn’t bother her, she can still run, jump, etc.). The physical therapist told me to get her special supportive shoes (they are quite stiff around the ankles). My husband is of the opinion that less is better. Barefoot whenever she can, etc. Do you think a minimalist shoe would be good for her? Thanks for the response Blaise! Thanks for that! And since I’m from Seattle, I tend to think that article is very credible 🙂 Time to find her some minimal shoes! Any recommendations for barefoot toddler shoes other than leather-soled shoes? My 20 month old has a chronic habit of finding every puddle she can walk through. The leather-soled shoes are machine washable; however, when they get wet they tend to rub on her ankles. She’s barefoot most of the time, but there are always places where it will be unsafe or unseasonable. 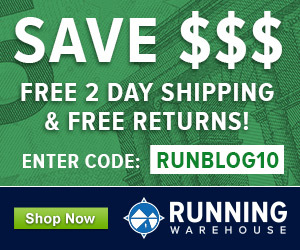 Merrell, Vivo Barefoot, etc. 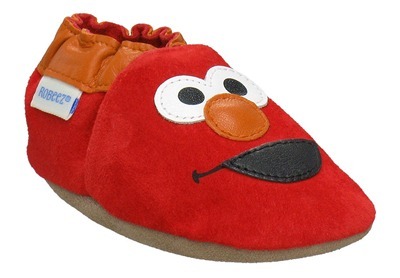 don’t make shoes in her size – Toddler 7.5 or euro 24. Any ideas? I tried soft star shoes and they fell apart in under a month. She’s a rough girl. 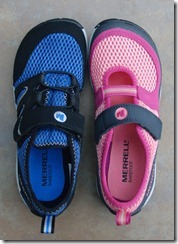 They’re new Merrell’s in infant/toddler sizes, awesome shoes! Oh wow. That is just what I am looking for. I was lamenting that I couldn’t get her Merrells yet. Thanks so much! No problem, hope she likes them! Hello again – I ordered my daughter a pair of the Merrells. She is walking and running great in them. However, I have noticed that the back half of the shoe is extremely stiff. I guess if I think about it, your foot doesn’t really bend much from behind the ball of your foot back to the heel. 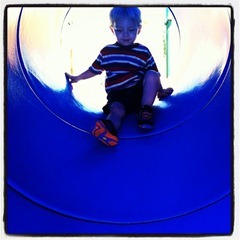 But I was told that the ideal toddler shoe should be so flexible that you can roll it into a ball. I’m sure if you put them on your son, then it is not an issue. I have scrutinized her gait barefoot vs. the merrells vs. the leather soled, and I don’t see much of a difference. I personally have HORRIBLE, inflexible, weak feet (I’m working on it) and plantar fasciitis, so I just want to do all I can to help her feet develop properly and in a healthy way. Thanks! Yes, the flex is mainly from the midfoot forward, but this is where most of the foot flex is located when barefoot so I don’t view it as a problem since the front half is very flexible. My son is 8, he just finished Cross Country and was an All American. He is ready to start training for track and field and I want to make sure I buy him the right shoe. I took him to one of our local sport stores and they ran him and said he is neutral in his gait and he measures around size 2. I would prefer to try on shoes with him but there doesn’t seem to be a demand for kids running shoes in our area. Can you please recommend a great shoe so I don’t have to keep ordering different ones on line. I wondered about the Saucony Kinvara 2 but now I see there is a 3 and I also looked at the asiscs nimbus. But I am happy to listen to what you think would be best. Thanks so much! I interact with almost all of the shoe companies since I review footwear, but am not employed by any of them. This is an independent website. I’m an advocate of minimal shoes for kids, my own kids wear them. But, if your son has only been wearing cushioned shoes then there is some risk to removing it since the foot will not be as adapted to the lack of cushioning. Honestly, we just don’t have a lot of great data on transitioning footwear in kids to know what is best if they have grown up in cushioned shoes with a raised heel.